To communicate and celebrate 30 years of international effort in protecting the ozone layer. A campaign that includes a series of animations, visual images, print and online communication tools to help communicate what the ozone layer is, where it is in the atmosphere and what has been achieved under the ozone protection regime. Image from 'Precious Ozone' film - all the ozone brought together at sea level temperature and pressure would fill a sphere 14 km in diameter. Image from 'Precious Ozone' film showing the edge of space. 99.99997% of air in the atmosphere is below this level. Image from 'Precious Ozone' film showing the edge of space. 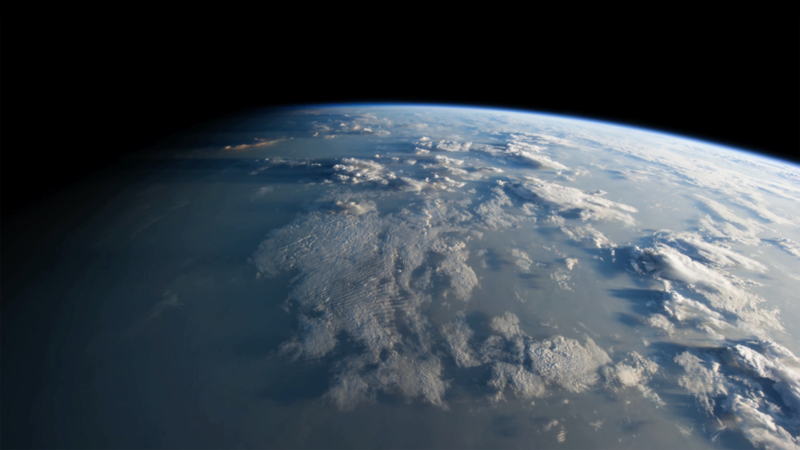 Image from 'Precious Ozone' film - footage from the International Space Station. 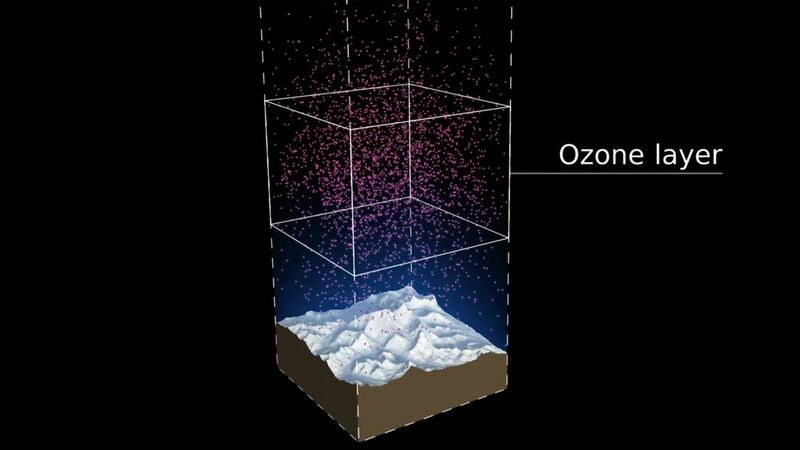 Image from 'Precious Ozone' film - the distribution of ozone in the atmosphere. 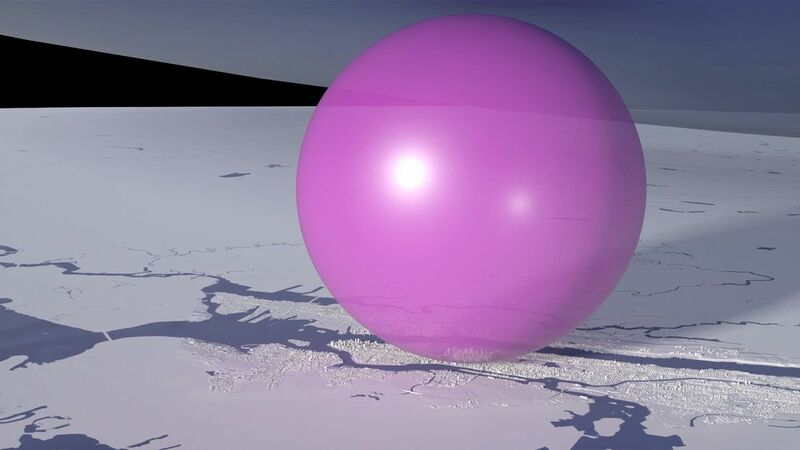 Each pink spot in this 20 km x 20 km column of air represents 10 billion billion billion ozone molecules. Thirty years ago the first images of the ozone hole created a media storm and helped lead to the Vienna Convention for the Protection of the Ozone Layer and the Montreal Protocol. People only had to look at a picture to physically see atmospheric chemistry. It didn’t take much persuasion to convince the policy makers to take action. Carbon Visuals was honoured to be asked to create a digital campaign to communicate and celebrate the 30th anniversary of this event. We did not want to ‘re-invent the wheel’ so we started by researching what we felt was missing from ozone communications to date. Our view was that few people have an intuitive sense of what the ozone hole is like, where it is, how much ozone there is, or how deep the atmosphere is. So we have created a selection of visual images, animations and web-tools that help everyone from policymakers to children better understand these things. Over the coming months different elements will be releasedalongside key events within the UNEP calendar. This week, July 20-23, we are releasing two elements. 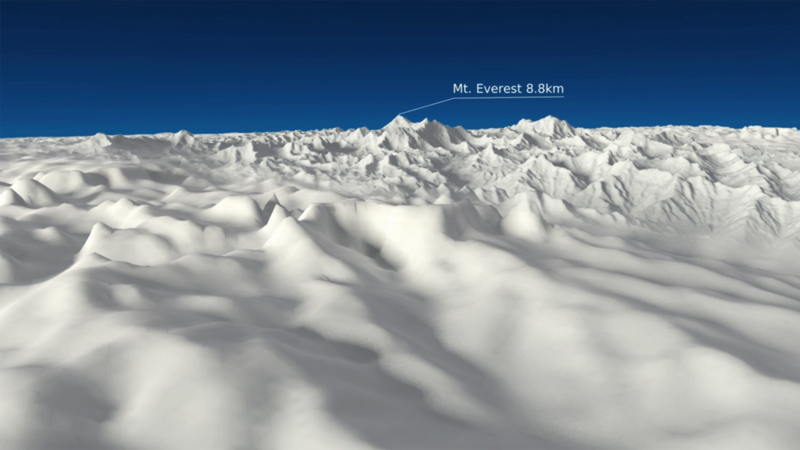 A short animation and a set of still images give viewers a sense of scale for how much air there is in the atmosphere and how much of it is ozone. 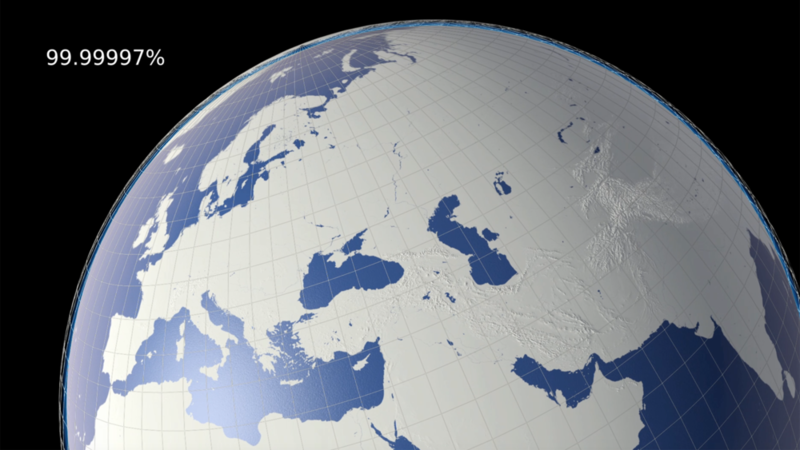 An interactive / self-running globe that displays current ozone distribution and also celebrates each country’s ratification of the Vienna Convention. Using a model of a typical US house, combined with US metrics - tons, gallons etc. - helps make the images more real for Americans. To illustrate the emissions resulting from TV production for an industry conference at White City. Animation that shows the real-time emissions associated with making one hour of broadcast ready production, and image set. The television industry is taking steps towards addressing sustainability issues associated with TV productions. A key tool, created by the BBC and made available through a partnership with BAFTA, is Albert - a bespoke carbon calculator. 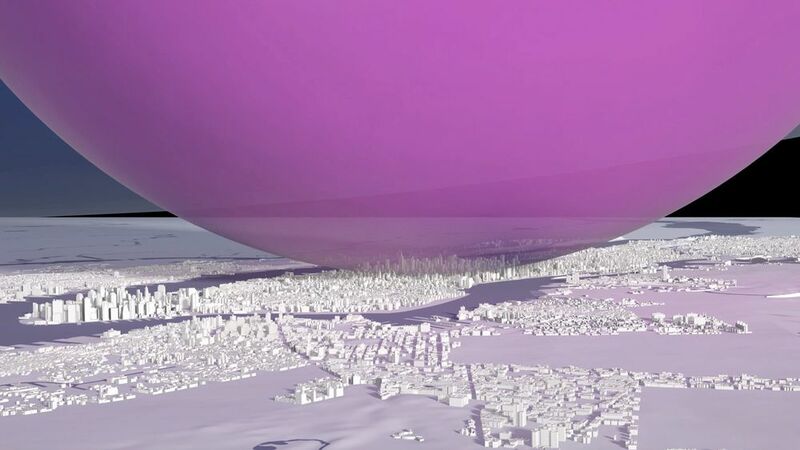 Carbon Visuals was commissioned by the BBC to produce a set of images and a real-time animation showing the emissions resulting from one hour of TV programming. The data was provided by about 80 productions that were the first to use the Albert calculator at the BBC. This animation was created for the BBC and shows the real-time emissions associated with making one hour of broadcast ready production - equivalent to about 8.2 tonnes of carbon dioxide. Average emissions associated with the major stages of a production are here shown in order of size and as a whole, depicted in front of the BBC White City building. 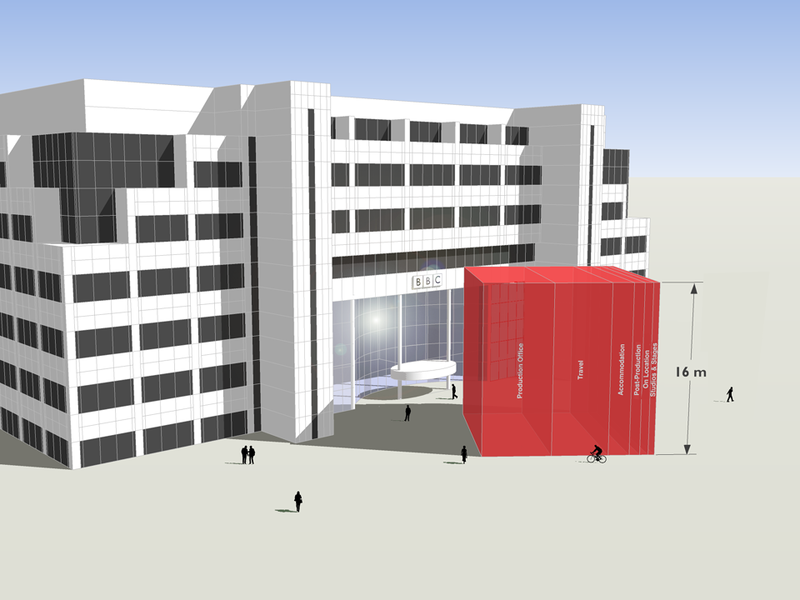 These visuals were first shown at an industry conference, which took place in the iconic BBC White City building that is depicted here, on 3rd November 2011. The PDF illustrates the emissions of different parts of the production process. Albert was developed & trialed within the BBC in 2011, with production managers and coordinators providing data on about 80 programmes. While there were considerable variations between productions, the average (mean) rate - about 8.2 tonnes of carbon dioxide per hour - provides a first attempt at establishing a figure against which programme makers will be able to gauge progress in future. Annually within the BBC, about 3,800 hours of TV are produced in-house. 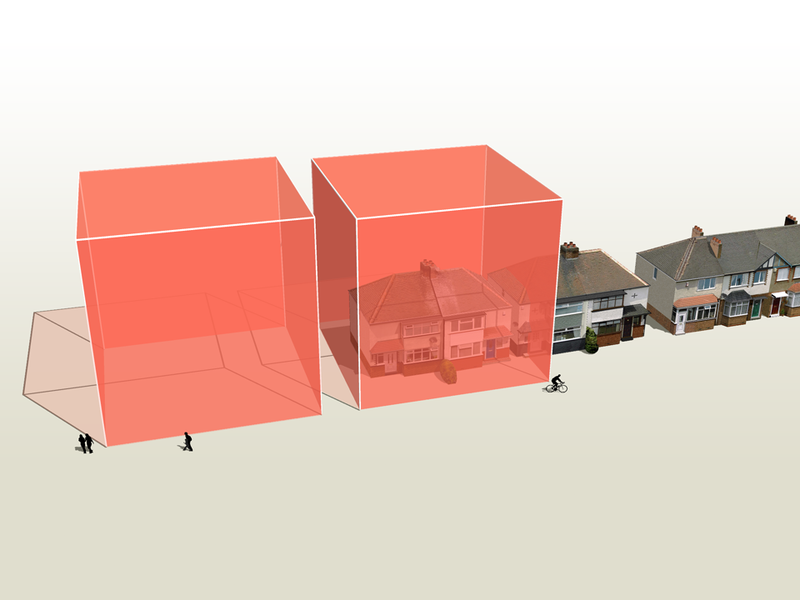 An annual volume of emissions, based on the average rate per production hour for programme emissions calculated using Albert, is here shown with familiar BBC buildings in Salford and London for scale. The average (mean) rate of emissions associated with TV production, based on data from about 80 programmes, is about 8.2 tonnes of carbon dioxide per hour. This is roughly equivalent to the annual emissions associated with space heating, heating and lighting for a pair of semi-detached houses (figures provided by the BBC). Based on the average rate per production hour for programme emissions, 11 hours of production time would fill the void in the centre of the BBC Television Centre in London - a space that is well-known to production teams. This image shows a playful way of depicting the scale of carbon reduction laid out in the Carbon Management Plan. The reduction could be likened to removing 22 keys from a piano. It is not a volumetric representation. This image shows the annual and projected CO2 emissions if the carbon management plan is successful. This image shows per person emissions since 2005/6 and target reductions to 2013/14. The shaded area indicates Business as Usual. 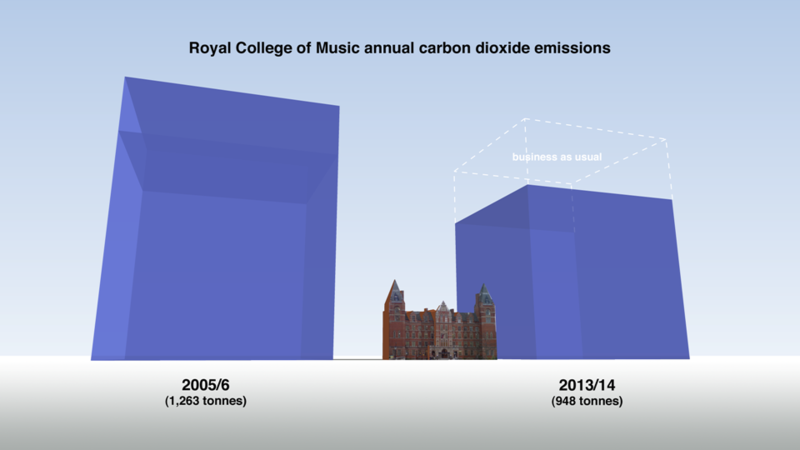 The Royal College of Music worked with the Carbon Trust to develop a Carbon Management Plan, which was published in July 2010. The Plan highlighted a number of actions that could be taken to reduce emissions by 25% by 2013/14. A key part of the Plan was to get students and staff engaged in the issues, so Carbon Visuals were invited to find innovative ways to communicate the carbon footprint and emissions reduction targets. 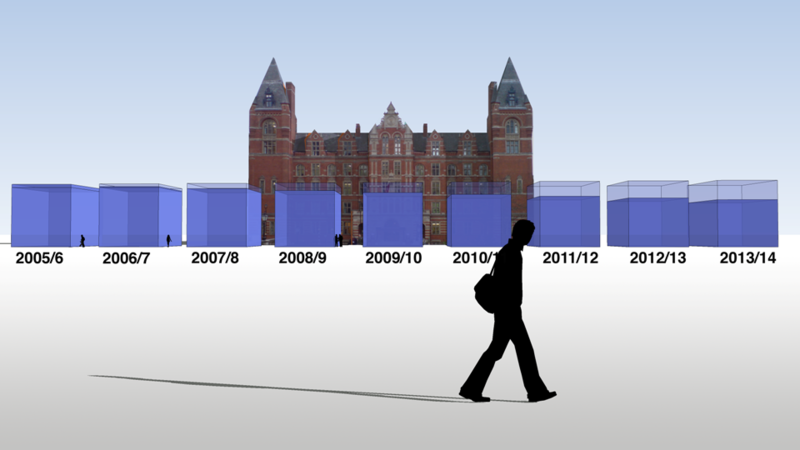 To turn abstract numbers into quantities that viewers could relate to physically, we used a depiction of the College building. We also proposed a way for musicians in particular to gauge a 25% reduction – it’s like losing nearly two octaves from a piano. Some of these images are being used for posters, leaflets and presentations to help staff and students have a better understanding of their carbon footprint and create ‘ownership’ of reduction plans and targets. 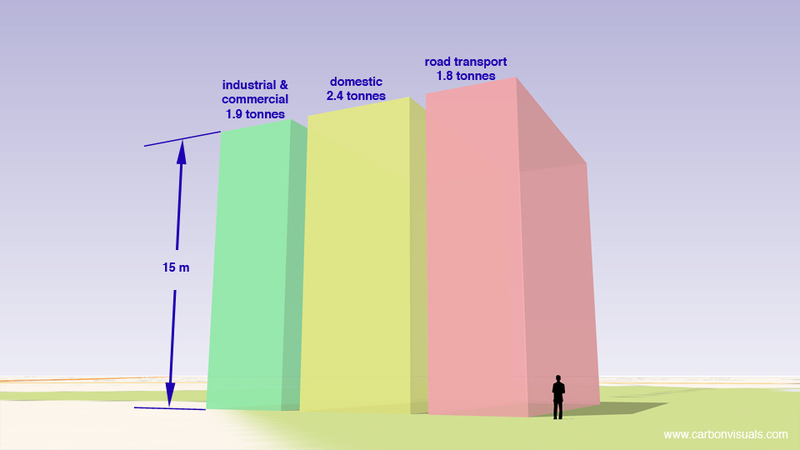 BBC One Planet's annual emissions as a tower of 10-tonne cubes (actual volume of gas). BBC One Planet's annual emissions as a pile of 1 tonne cubes of gas. 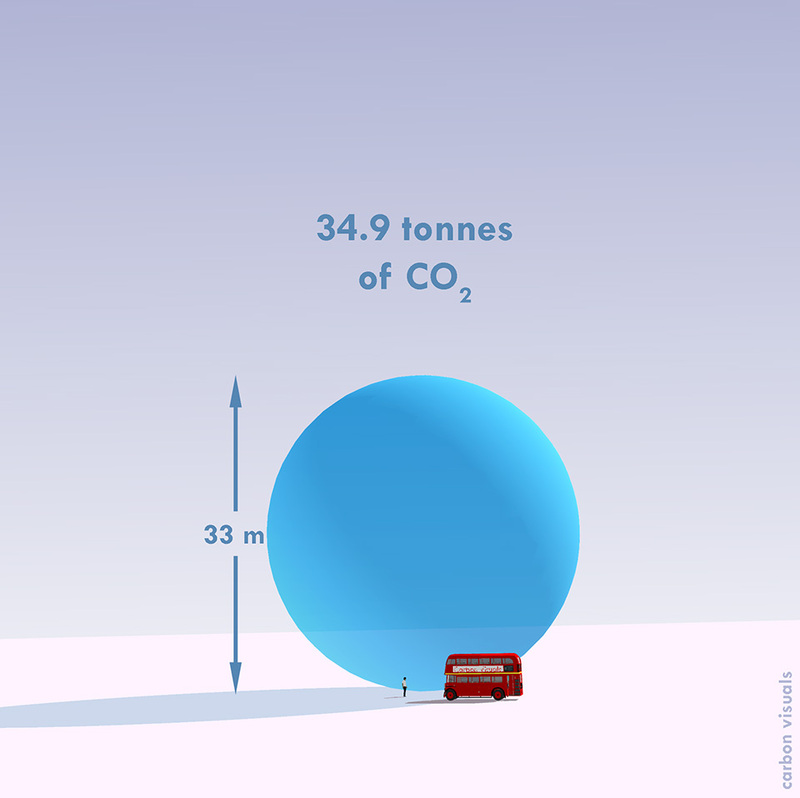 BBC One Planet's annual carbon footprint as a sphere of carbon dioxide gas. BBC One Planet's average daily carbon footprint (actual volume). BBC One Planet's average emissions per second. Visualising rates of emission on very small timescales, as here, allows viewers to see the emissions as dynamic. The One Planet radio programme on the BBC's World Service came to Carbon Visuals with simple question: "what does our carbon footprint look like?" One Planet was carefully accounting for emissions arising from the making of the programme and had arrived at a figure of about 34.9 tonnes per year. But what does that mean? Measuring carbon dioxide in terms of mass (tonnes) makes sense from an accounting point of view but doesn't give us a sense of scale we can relate to. 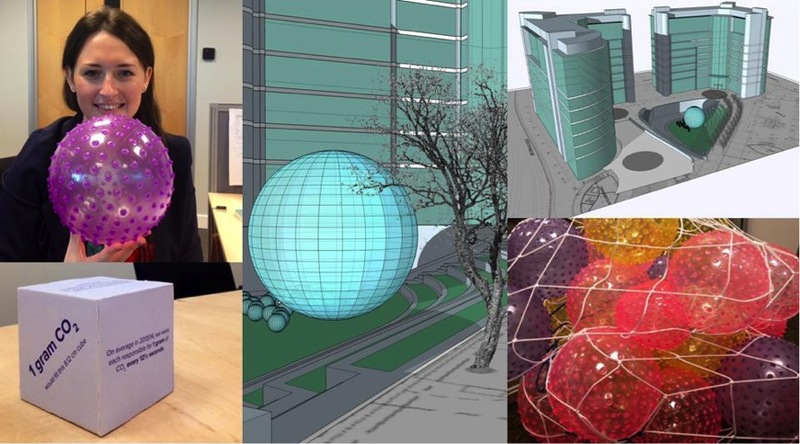 We examined a variety of alternative ways of representing One Planet's footprint. 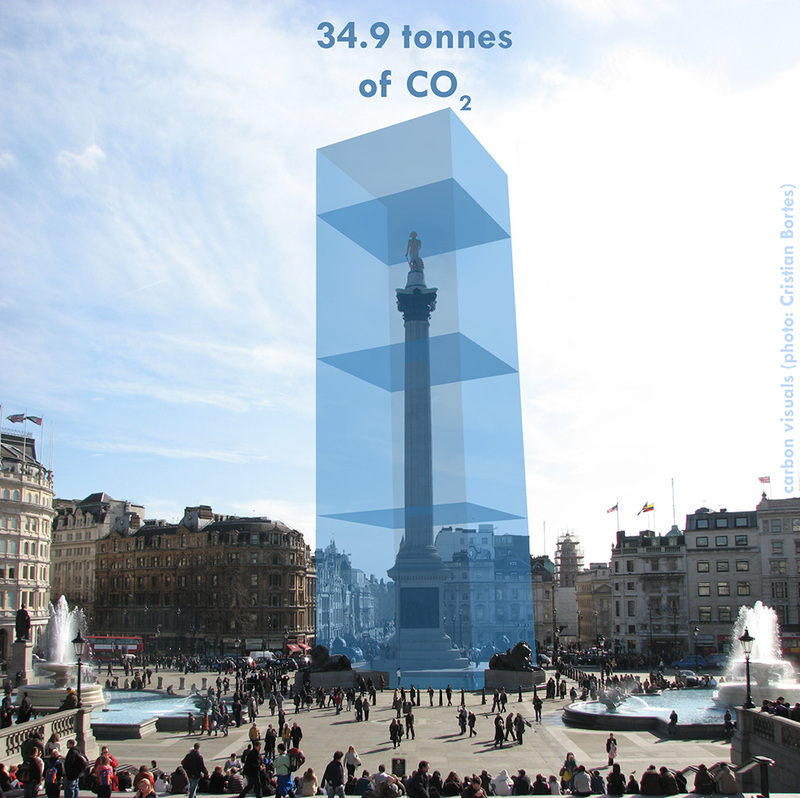 We have shown the programme's annual emissions by volume in a recognisable location and in relation to an iconic feature - Trafalgar Square and Nelson's Column. 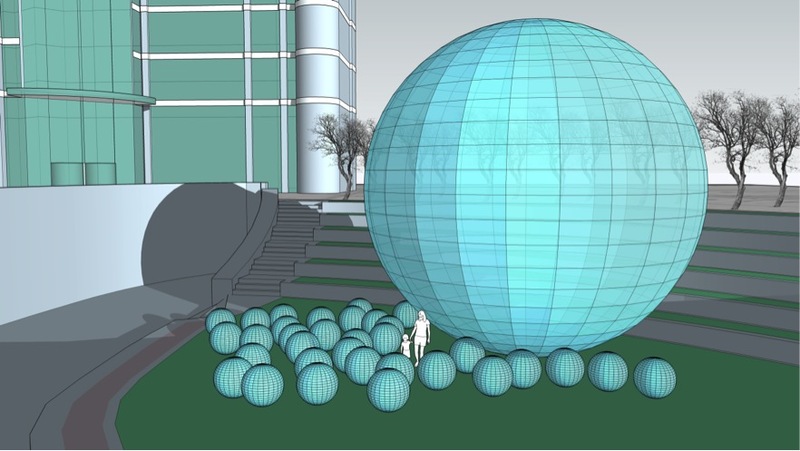 These provide a sense of scale that enable the viewer to relate to the volume. You can hear a discussion about this project, first broadcast on Thursday 8 April 2010, by visiting the One Planet website. Guardian News and Media's daily carbon dioxide emissions. Guardian News and Media's daily carbon dioxide emissions - 39 tonnes. The Guardian News and Media Group turned to Carbon Visuals to get employees involved in reducing the company’s carbon footprint. On an average day between April 2007 and March 2008, GNM emitted 39 tonnes: 20 tonnes from two print sites, 14 tonnes from offices and five tonnes from business travel. The Guardian offices are near St Pancras Station - a landmark that employees can relate to physically. Viewers can see the picture and know what such a pile of one tonne cubes would be ‘like’. Guardian News and Media's daily carbon dioxide emissions. On an average day between April 2007 and March 2008, GNM emitted 39 tonnes: 20 tonnes from 2 print sites,14 tonnes from the old offices and 5 tonnes from business travel. 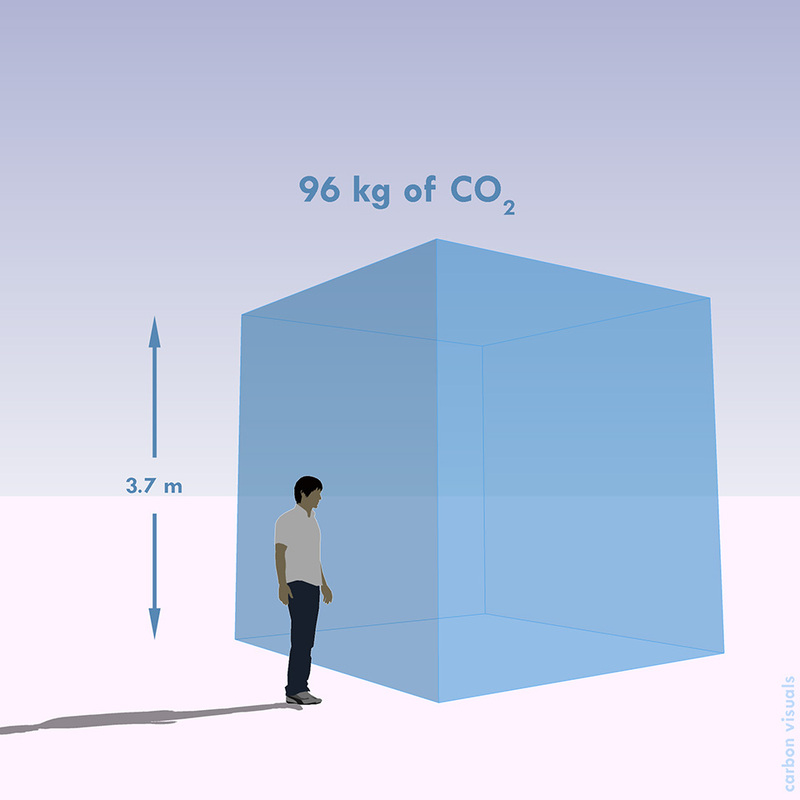 One tonne of carbon dioxide gas would fill a cube of 8.12 metres high. Viewing the pile of 1-tonne cubes from eye-level can give a viewer a better sense of the height. Central Bedfordshire Council needed a way to involve key stakeholders and staff in meeting targets for emissions reduction. 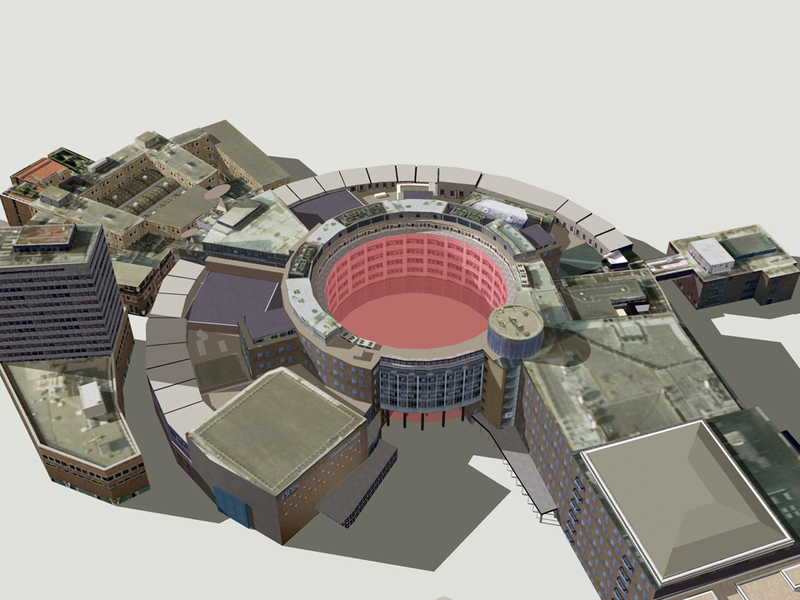 We produced volumetric visualisations that make reference to landmarks and areas that these audiences can relate to. We also produced animations that bring the figures to life by showing the emissions from different council activities in real-time. The Council used the visualisations in a stakeholder conference but they also found them useful for new employees, strategy documents, and the Council’s website. These visualisations are a huge breakthrough and will enable people to clearly see the impact our carbon emissions are having on the environment and the level of responsibility that falls on each one of us to assess and change our activities. Instead of trying to communicate the complexities of climate change, we believe that a simple understanding of how we are changing the atmosphere of the planet could transform society’s view of the need for a low-carbon future. Every day we wrap the planet in a paper-thick layer of carbon dioxide! We’ve done the maths and it’s true. The 80 million tonnes of CO2 we release to the atmosphere every day by burning fossil fuels would be 80 microns thick if it were a single, uninterrupted layer at 100% concentration over our heads. Over the course of a year, that amounts to 31mm, or over an inch. We call this imagined layer the Carbon Quilt – since pre-industrial times its thickness has increased from 2.3 metres to 3.2 metres. In 2010, with support from The Tedworth Charitable Trust, we 'soft-launched' our Carbon Quilt web-tool that enables people to ‘see’ any carbon footprint – from a short car journey to the footprint of a country or continent. Any carbon footprint can be seen in proportion to any other, and in proportion to the global whole. It can also be positioned in a location that has meaning and provides a sense of scale for the person viewing it. 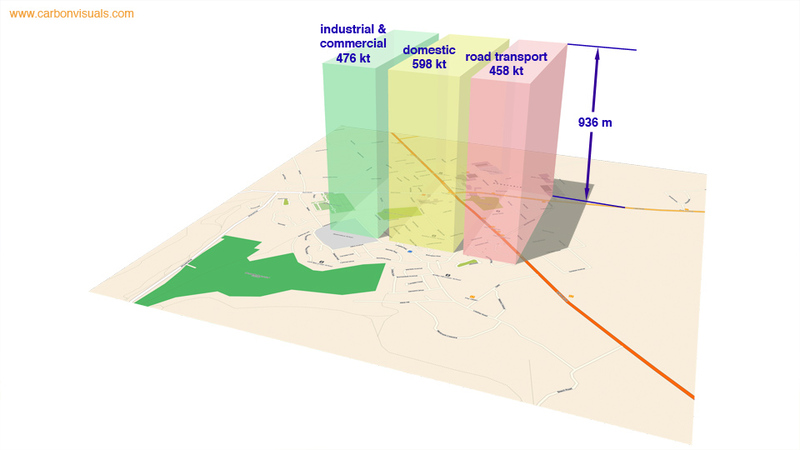 Carbon Visuals has ambitious plans to develop this technical prototype tool on Google Earth to bring the abstract concept of 'carbon footprints' to life for over a billion people worldwide. We are now actively seeking funding and/or sponsors to help us to develop this project. Please contact us if you have funding ideas, contacts or expertise that could help advance this project. To the left is a picture for the BITC (Business in the Community) Mayday Annual Report 2010. Each year humans release enough carbon dioxide to cover the entire planet in a layer 37 mm thick. The proportion of this 'quilt' that reporting Mayday Network businesses are responsible for is the green 'patch'. Total reported emissions in 2010 (green patch) is 5.6 million tonnes of CO2(e). Emission reduction in previous 12 months is shown as the dotted area. 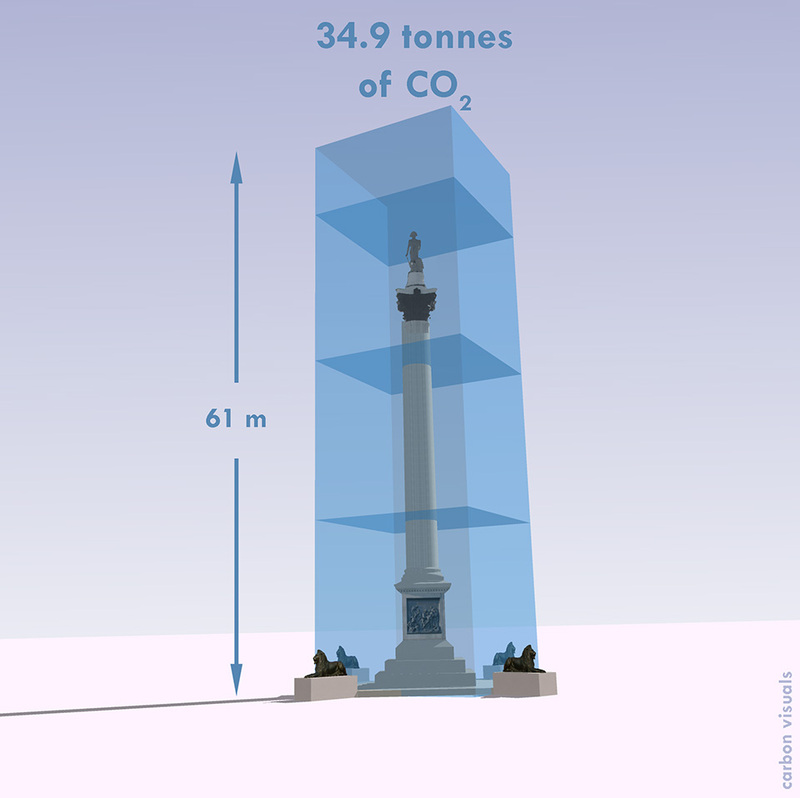 It represents a saving of 400 thousand tonnes of CO2(e).